It’s interesting how these meme’s pop up on my Facebook time line. 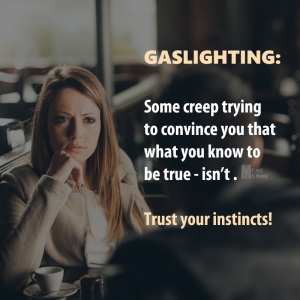 Gaslighting ties in with my previous post on Cognitive Dissonance, except there’s a reversal with a more assertive approach to get you to deny your truth and accept their version. This entry was posted in Denial, Feelings - Emotions, Health & Wellness, Imprint-programs-beliefs, Self-Empowerment, Society - Culture, Soul (Will) - Intuition-feelings-emotions, Spirit - (Mind) Thoughts - ideas and tagged denial, gas-lighting, gaslighting, truth by johnrieger. Bookmark the permalink.